By now, you know that I have a pretty decent personal library of Bibles, Greek and Hebrew reference books, and commentaries and other reference books on scripture and theology, and an Internet connection. I either have or can get information on a lot of stuff. Where I can't get information, I make something up, so be sure you read the Bible for yourself, without believing anything I tell you. This one, though, is beyond me: so much contradictory stuff has been written that it is probably impossible to make up anything new about Epiphany! Matthew 2:1-12 says that wise men saw a star; came from the East to Judea; talked to Herod; gave gold, frankincense, and myrrh to Jesus; and left. Everything else has been added, mostly way after the fact. A few people reject the whole scenario, on the grounds that it is only recorded by Matthew - I will say that I think that's silly. Most of ancient history and much of modern history is only recorded by one source, so to be consistent you would have to reject all of that, too. The earliest unambiguous mention of Epiphany is from Clement of Alexandria, who lived from 150 to about 215. He doesn't seem to have associated it with gift-giving, however. After that, things get murky. When the wise men arrived; what exactly is being celebrated (Jesus' birth or baptism or visit from the magi); how it's celebrated (church or gifts); who started the celebration; what the names of the magi were; how many magi there were (2, 3, 4, or 8); where the magi came from; what the symbolism of the gifts was (if any); who made up all this stuff; and above all, how it turned from a liturgical celebration into a gift-giving hoopla are ALL unknown! Apparently most of the Epiphany traditions, dates, and names now celebrated on and around Jan. 6 arose somewhere in the Western world between the 2nd to 8th centuries A.D., but their precise origins are mostly lost. Personally, I like the idea of moving some of the Christmas celebration to Epiphany, if only to take some of the pressure off of Christmas. By the time we, as a church, have practiced for and attended Lessons and Carols and Christmas Eve services, packaged up food boxes and Angel Tree presents, gone to Christmas parties, sent Christmas cards, prepared and eaten Christmas Breakfast and Christmas Dinner, decorated, shopped for gifts, wrapped gifts, mailed gifts, given gifts, opened gifts, and exchanged gifts, we are exhausted. No wonder the Sunday after Christmas is one of the most poorly attended services of the year! I think that everyone in New Mexico ought to consider moving some of the hoopla to el Dia de los Reyes. The story that I heard is that the names of the three wise men came from Spain. Caspar (or Gaspar), Melchior and Balthazar are all Spanish names. Also, I heard that the reason that one of the wise men is black has to do with Spanish paintings. As you may know, Spain was occupied by the Moors for hundreds of years. During that time, many Africans came to the peninsula. Artists began painting a black wise man (I think it was Balthazar) in order to show the diversity of Spain. You can say that it was an early example of multiculturalism. In the Spanish culture Three Kings day is always celebrated as the day the three Kings bring presents to the children as they did to Baby Jesus. the gifts are for the children not the adults. The adults eat, drink and party a lot. Christmas day is not a big deal as far as presents is concerned. It is a family get together day. With the American culture influence some families celebrate the gifts giving both days. Your last paragraph summed up exhaustion after Christmas perfectly. I would also like to add fitting in work while doing all the other things you mentioned. Every year I get the same lecture after Christmas from my spouse--it's time to get back on track (ha ha). Thanks. 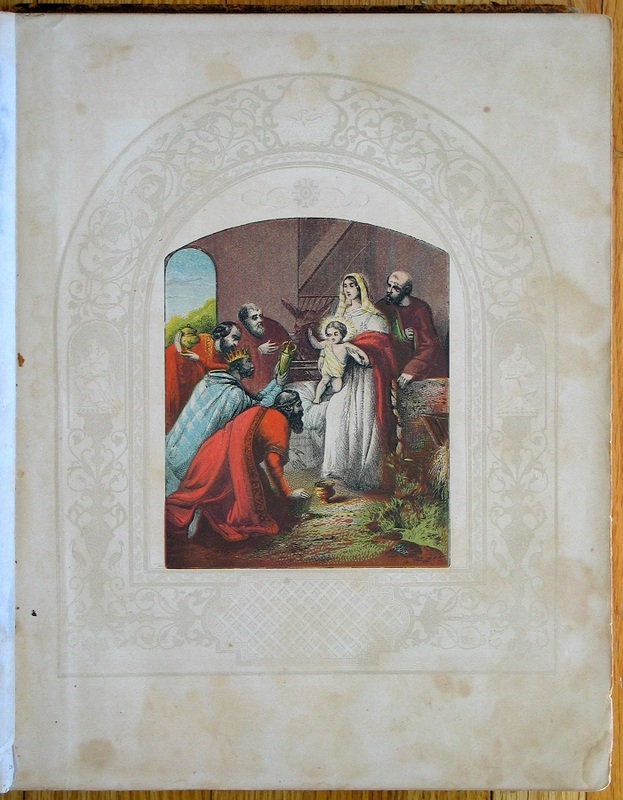 The painting showing the visit of the magi is from the family Bible of John O. Spencer and Lydia Bunn, married 18 Nov. 1857 in Hector, Schuyler Co., NY. A complete listing of the posted images from this Bible is given at Ducks in a Row, Inc.